Community suppers keep plates full and hearts warm. Grace Episcopal Church parish hall was welcoming last Friday on a chilly evening as guests arrived for the community supper. Round tables were set, and volunteers bustled in the kitchen, calling out greetings. At 5 pm the crowd quieted as grace was offered. A line formed at the buffet, where volunteers served heaping plates of warm, home-cooked food with equally warm smiles. Thanks to coordinator Leslie Frizzell, this year’s dinners at Grace Church feature a different theme each week, and all include nutritious protein entrées. For Comfort Food Night, turkey and shepherd’s pies were served. Mexican Night featured “make your own” beef tacos. At a festive Chinese New Year celebration coordinated by parishioner Gloria Wong assisted by Girl Scouts, diners enjoyed authentic dishes. S’mores made with tiny gas burners topped off Cookout Inside night. Rolls are baked by MVRHS culinary arts students. One parishioner faithfully brings devilled eggs. Traditional jambalaya is a favorite. One generous regular drops dessert donations in the kitchen each week. 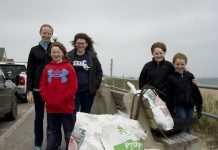 Guests lingered last Friday while volunteers cleaned up. Coffee cups were filled and the hall was alive with laughter and easy conversation. Grace was one of the first parishes to begin community suppers in the mid-1990s, and today’s meals draw from 30 to 50 on Friday nights. This heartwarming scene is re-enacted seven days a week all winter at places of worship across the Island. 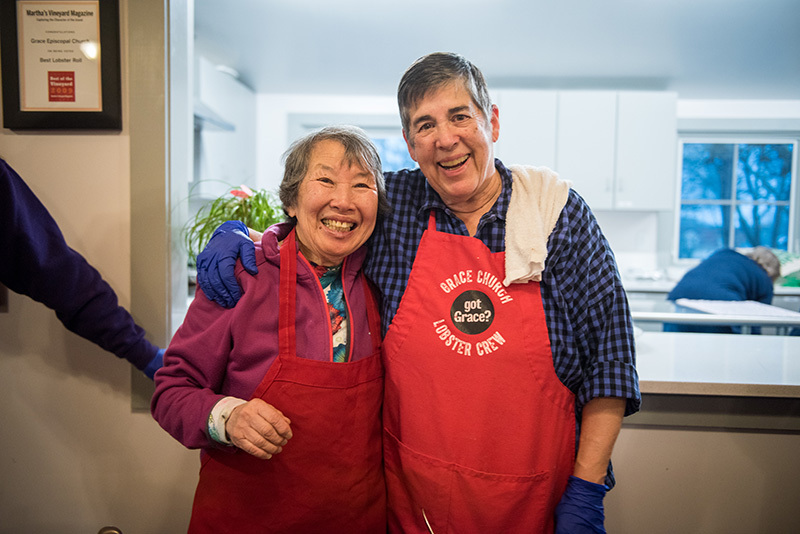 Locations, volunteers, and menus differ, but the generous spirit and goal are the same: to offer good, nutritious food in a friendly atmosphere, along with fellowship, to help neighbors through the dark winter months. Many guests are regulars at the churches, attending every week, and most meals continue from January through March. 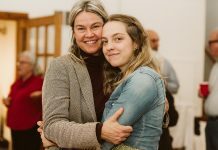 Churches host largely adult and older crowds, with some young families. 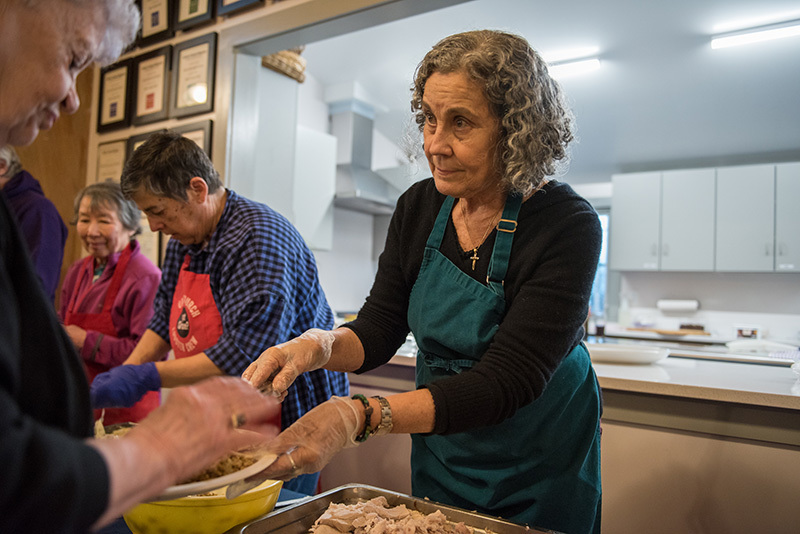 Parishioners and busy volunteers often join guests for a meal, and most host sites also send dinners for Houses of Grace homeless shelter guests. Combinations of resources support the programs. 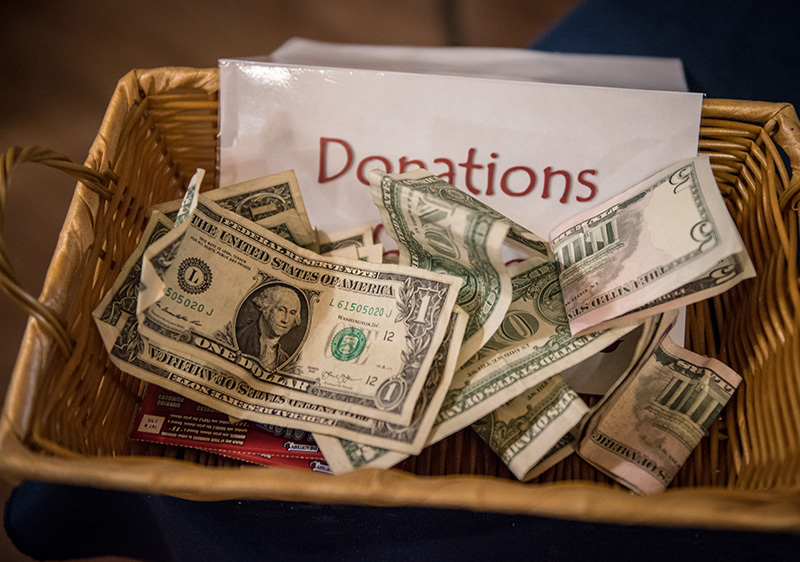 Some churches have budgeted funds; most receive food and cash from parishioners, and donation baskets bring in some revenue. Organizations such as M.V. Community Services, Martha’s Vineyard Rotary Club, the Permanent Endowment, St. Vincent de Paul Society, and the United Methodist Society chip in. Food is donated by local businesses, IGI Gleaners, Serving Hands, or is purchased at bargain cost from the Greater Boston Food Bank. Dinners are served Wednesdays at the First Congregational Church of West Tisbury. Coordinated by missions chair Marjorie Peirce, cooked and served by stalwart volunteers, the meals attract up to 80 diners every week. Menus include soup, hearty entrées, sides, and desserts. Peirce, who works with the gleaners, gathers produce that she cans or freezes, then adds to meals. 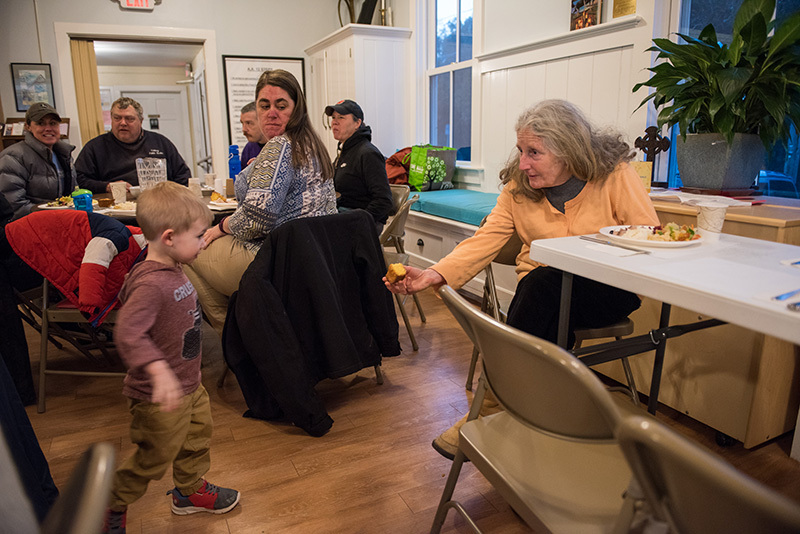 Another of the earliest churches to launch community suppers years ago, West Tisbury serves through April. “April is one of the toughest months; money is really tight,” Peirce said. The church sends out some 20 additional dinners each week to those unable to attend. At the Chilmark Community Church, one of two remaining Methodist parishes, supper is more intimate. There are usually fewer than a dozen guests, occasionally more. Winter dinners offer pasta, casseroles, or roasts with salads, sides, and dessert. 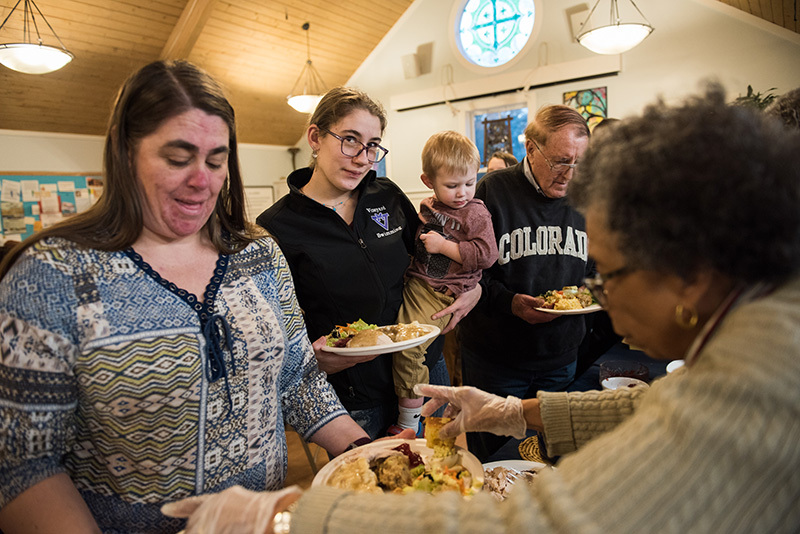 Pizza purchased from local eateries is served during “shoulder seasons.” The Tuesday gatherings bring mostly locals looking for comfortable conversation and a meal to share with neighbors. Thursdays through mid-April, St. Augustine’s Catholic Church in Vineyard Haven welcomes some 60 guests. Acting coordinator Mary Ellen Larsen said each of 10 committee members takes responsibility for one evening, and solicits desserts from parishioners. Chef Joe Capobianco, facility and event manager for Good Shepherd Parish, which includes St. Augustine’s, plans menus, procures groceries, and cooks delicious dinners. 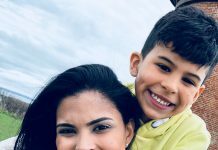 Bite on the Go in Vineyard Haven donates a kettle of soup each week. With a new lift, the downstairs hall is accessible, a boon for many diners. The meals have been held for seven years, with support from several sources. The M.V. Hebrew Center donates funds, and takes one evening each month to prepare and serve dinner. “It’s an ecumenical effort, which is quite nice,” said Larsen. Trinity United Methodist Church in the Oak Bluffs Campground features suppers prepared by professional guest chefs. Hal Ryerson, Deon Thomas, Tom Engley, and Carrie Welch are among them. Each volunteers to plan and cook one dinner. Saturday evenings the parish hall is packed with more than 60 hungry diners lured by a restaurant-quality meal. Elizabeth Villard oversees Monday dinners at St. Andrew’s Episcopal Church in Edgartown. Begun at the Old Whaling Church under United Methodist Church sponsorship in the 1990s, this event moved three years ago. Federated Church members began Sunday lasagna luncheons seven years ago. Many volunteers sing in the choir, and realized lasagna could heat while they were at worship. The hearty dishes are mostly homemade, and always include a vegetarian choice. Salads and crusty garlic bread complement the lasagna. Coordinator Pam Butterick said more than 50 volunteers helped last year. This winter, several confirmation-class youngsters are pitching in.